The CoffeeShop Blog: CoffeeShop Smoky Velvet Photoshop/PSE Action! CoffeeShop Smoky Velvet Photoshop/PSE Action! I am really excited to post my newest Photoshop/PSE action, CoffeeShop Smoky Velvet! 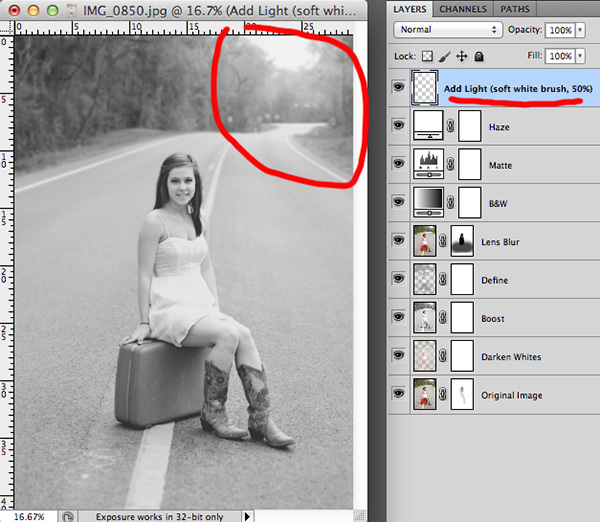 This is a completely adjustable B&W action that allows you to add optional matte effect, light, and lens blur. 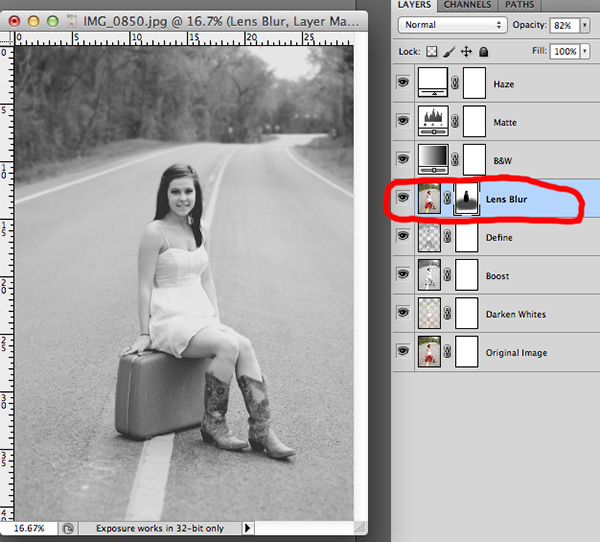 If you have clients who request it, you can easily add some simple selective color. 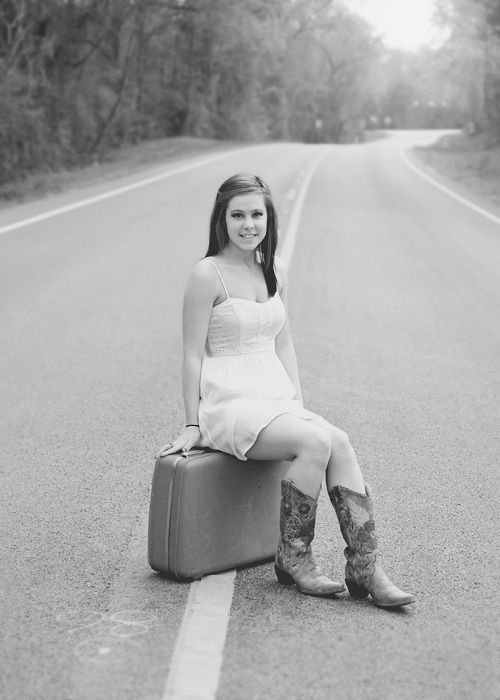 I used this beautiful image from Gentry's Photography in this tutorial. I also wanted to remind those of you that have purchased my mega download pack or action pack within the last two years that you can always send me an email to request my newest version. I update both packs almost weekly (I just added this new action), so if it has been a while you are completely welcome to a fee upgrade. That is one of the perks of your support of my site!!! Thank you so much for making all of this possible. 2. Adjust Depth of Field, Part 1: Run the action and adjust the lens blur setting that pops up to taste. 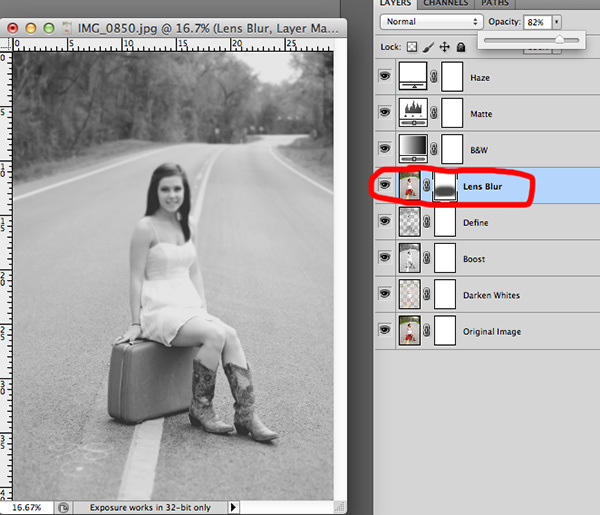 Blur the background without worrying about blurring your model, you will use layer masks and adjust the opacity later. You can even turn off the lens blur layer later if it isn't needed. Once the action is finished you will start painting on the Lens Blur layer mask. Click to select it and grab a soft black brush. On this image I started with my black brush set to 80% opacity and I brushed across the road and her suitcase/and boots to both ends. You can see the layer mask in the screenshot above. I also lowered the opacity of this layer to 82%. 3. Adjust Depth of Field, Part 2 and Skin Smoothing: Next I put my black soft brush at 100% and painted out the model's body/head, but stayed away from all edges. 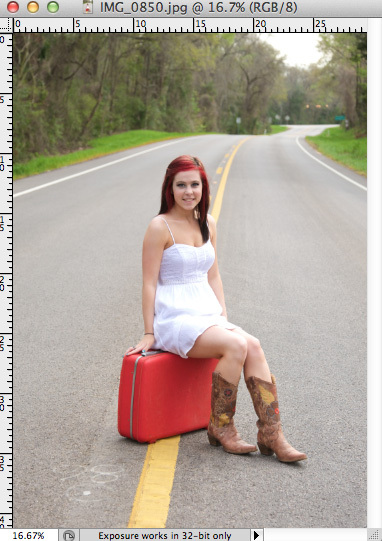 I did not remove any additional blur from her legs and boots. I put my black soft brush at 50% and made it quite small (press [ or ] keys to adjust on the fly) and painted over the edges of her hair and arms to remove blur. This gradual blur removal method looks more natural than using a 100% black brush to the edges of your model. I wanted to soften the skin on her face/neck a bit, so I made sure the Lens Blur layer mask was still selected and I grabbed a soft white brush at 30% and zoomed in and painted over the skin on her face and neck, avoiding her eyes, lips, and nostrils. 4. Adjust Layers and Brighten Hair: At this point you can adjust the other layer opacities to taste or paint on the layer masks. One trick to add some highlights to hair is the click on the bottom (Original Image) layer and use a soft black brush at low opacity on the hair to brighten it. 5. OPTIONAL: Add Light. If you want to add some light to the sky in your image, add a new blank layer on top and grab a soft white large brush at 50% opacity and click once where you would expect light leak. You can add more light or Gaussian blur the layer if needed. 6. 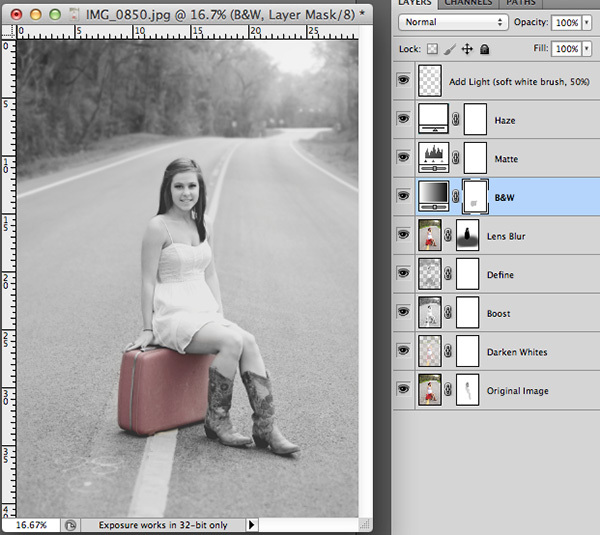 OPTIONAL: Selective Color. If you have an image which you would like to add some selective color, then click on the B&W layer's mask and grab a soft black brush set to 20-30% and gently paint back in color. 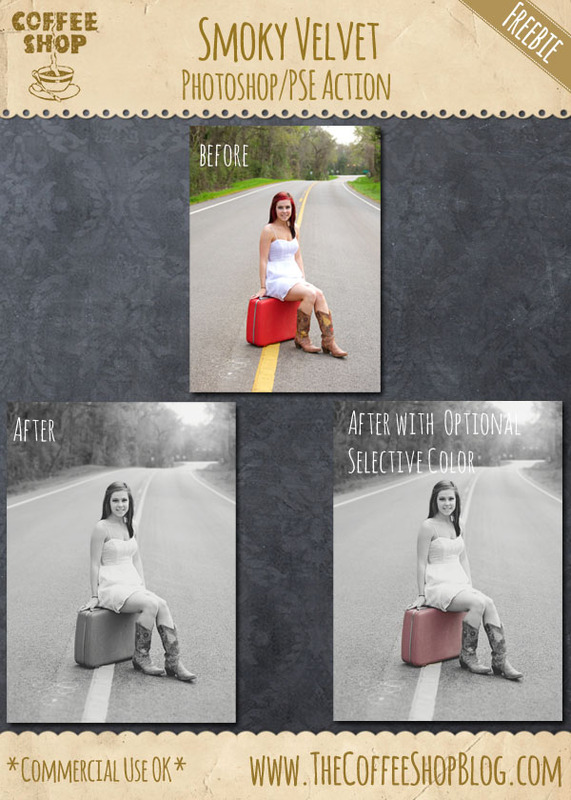 Selective color is something that should probably be used in moderation, but I still see quite a bit of it in print ads and I know photographers who have clients who love it. Remember, photography is art and art is subjective. 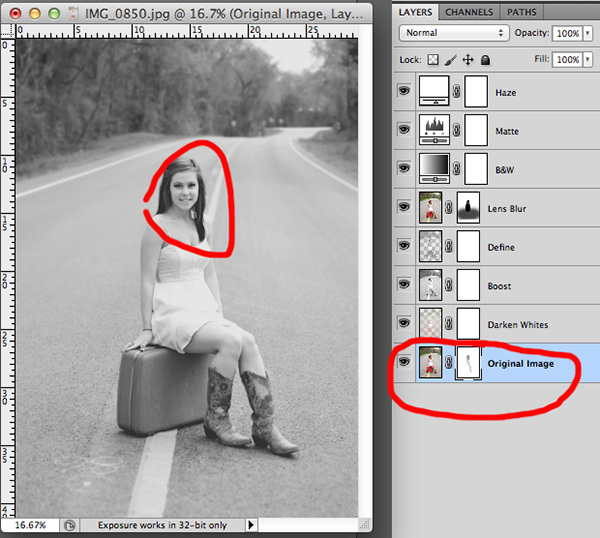 So have fun editing your images any way you want! Here is my final edit. I hope you find this action/tutorial useful in making your own photography art! Download the free CoffeeShop Smoky Velvet Photoshop/PSE action. You can also download it here.